UW Leaders – Leaders are made, not born. The 2019-2020 Mentor application is coming soon! We’ll be releasing app info soon during Spring Quarter! If you have questions please email asuwlead@uw.edu. The 2020 cohort of Leaders will consist of forty-four freshman, sophomore, and transfer juniors with a wide array of interests, majors, backgrounds, and perspectives! You can check out the 2018 cohort of Leaders by clicking here! 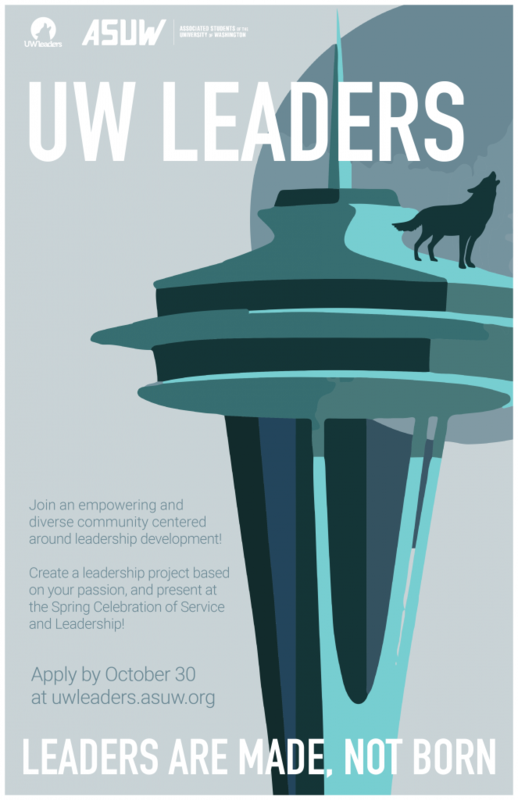 UW Leaders (UWL) is an entity within the Associated Students of the University of Washington (ASUW). UWL offers leadership-building opportunities for first, second, and transfer third-year students. Whether students have been involved in past leadership or are looking to get started, UWL gives students the tools and support necessary to become the leader they want to be. We believe that Leaders are made not born, so every student has the potential to be a change-maker on campus and the greater Seattle are! Check out this year’s workshops! Below is a schedule of all the 2019 workshop topics. Each week will be focussed around a different area of personal or professional development. As we move through the program, resources from each workshop will be posted on this site as well as in a Google Drive, so check back regularly for updates!